We left port today at about 6:30 AM, before the sun had even come up. We are headed out to the Florida Keys. The rain has stopped as well as the wind. We left Miami Harbor as the sun was coming up. 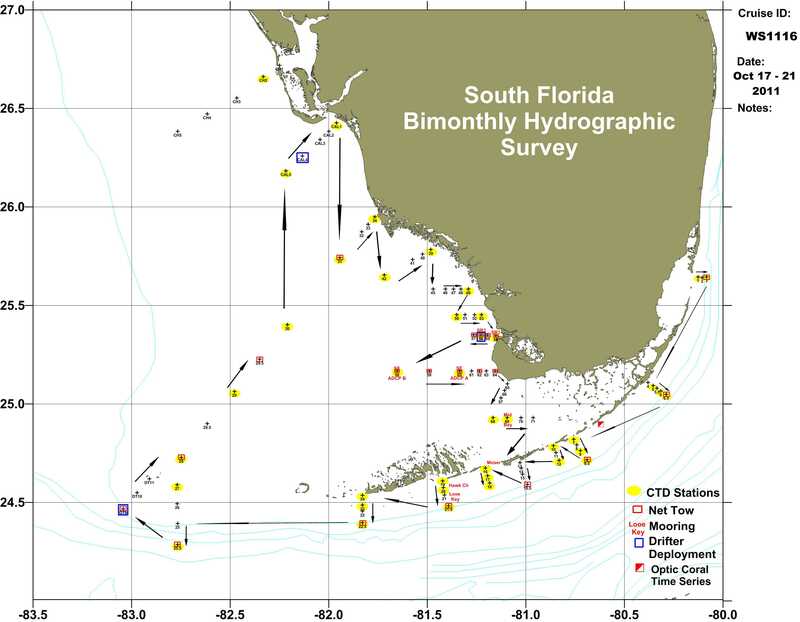 Our scientific research will take place along the Florida Keys, a chain of low-lying Islands that arc around the southern tip of Florida. 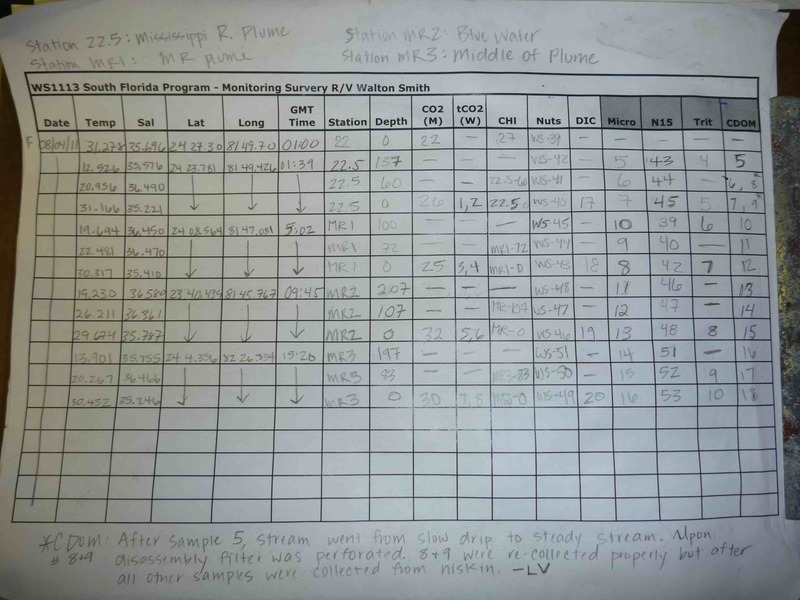 The R/V Walton Smith will stop at predetermined stops and take measurements. There are many science experiments happening on board. In each post, I will try to highlight a different experiment. 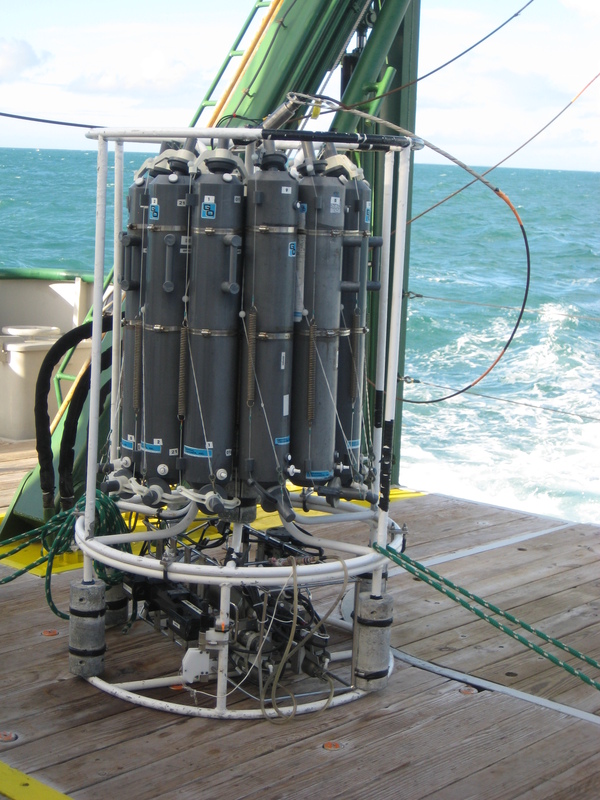 I’ll start off with the CTD because it is the experiment that drives our schedule throughout our cruise. 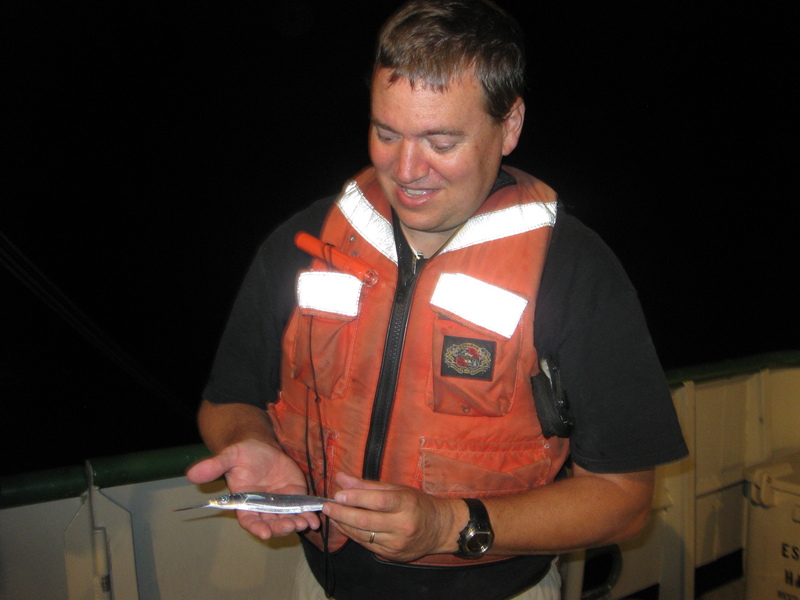 The Conductivity, Temperature, & Depth Instrument. Everyone on board calls it the CTD for short. The CTD schedule is our game plan. At about every 3 -5 hours — night and day — we’ll cycle through a series 3-4 CTD drops. These are the instruments on the lower part of the CTD. 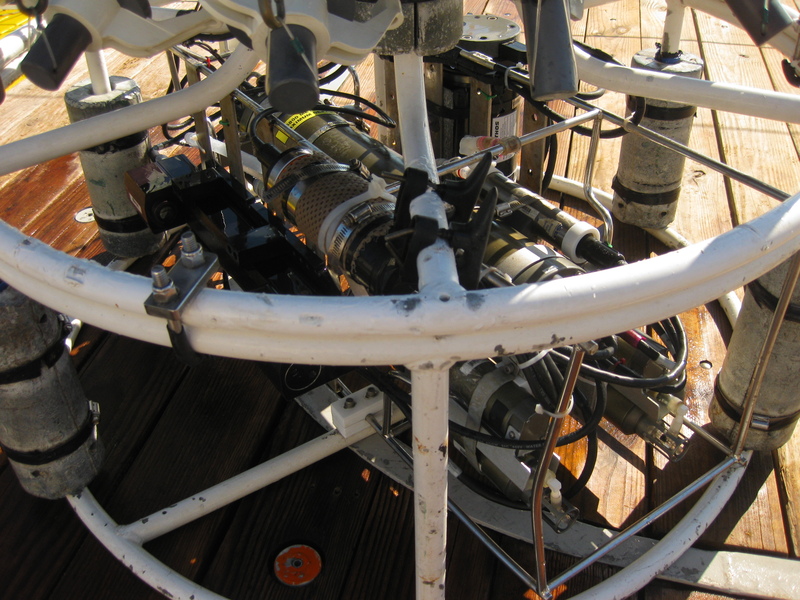 On the bottom of the CTD are a number of instruments that give real-time data to a scientist on board the boat. 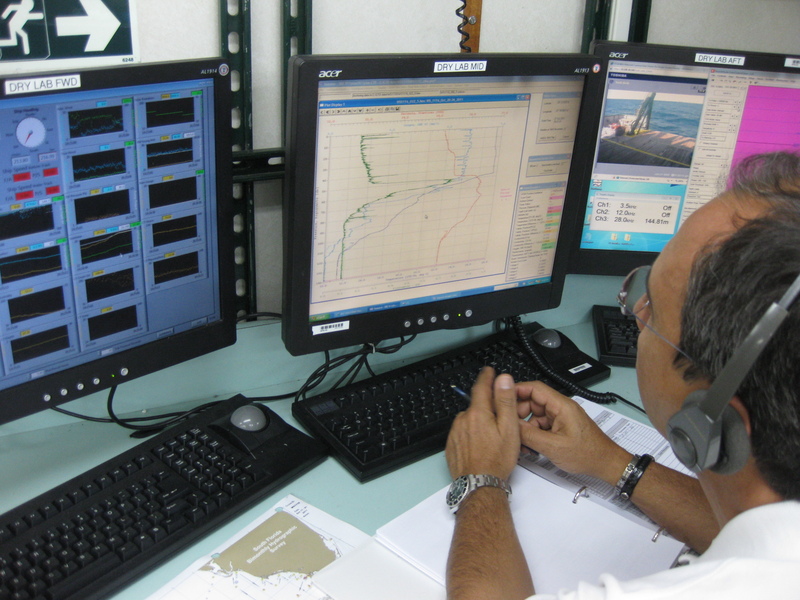 The conductivity part of the instrument measures how much electricity passes through the sea water. Using a mathematical algorithm that takes in account temperature and how much current passes through the water, we can determine the density (salinity) of the water. The CTD on deck. The grey tubes fill with water. The top part of the CTD has 12 cylinders that can trap water. Those are the grey tubes you see in the picture to the left. There are lids on the top and bottom of each tube that can be closed with a remote control from inside the boat. 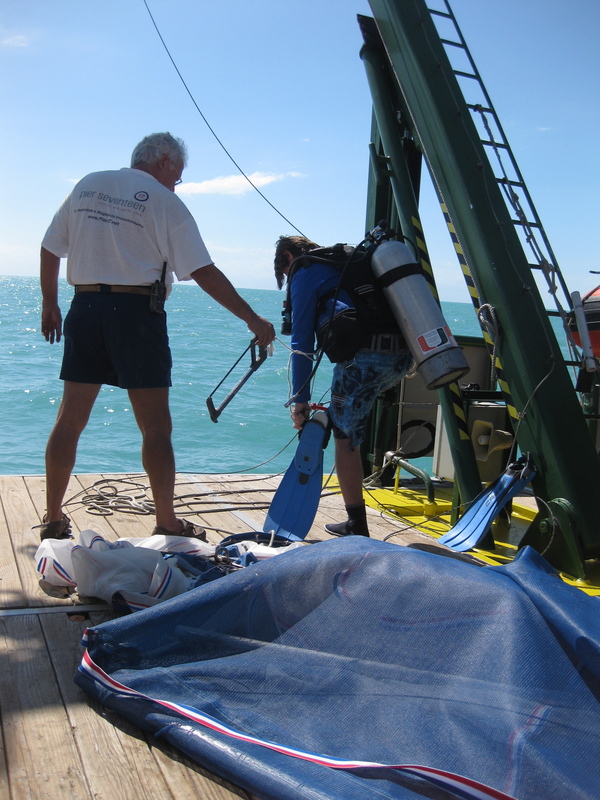 In this way the scientists can take water samples from any depth of water. So, when we arrive at one of these predetermined location we’ll lower the CTD. Once the CTD is just below the surface of the water and everything checks out, the scientist will radio to the crane operator to lower the CTD to within a meter of the bottom of the ocean. That can be anywhere from 5 meters to over 100 down. 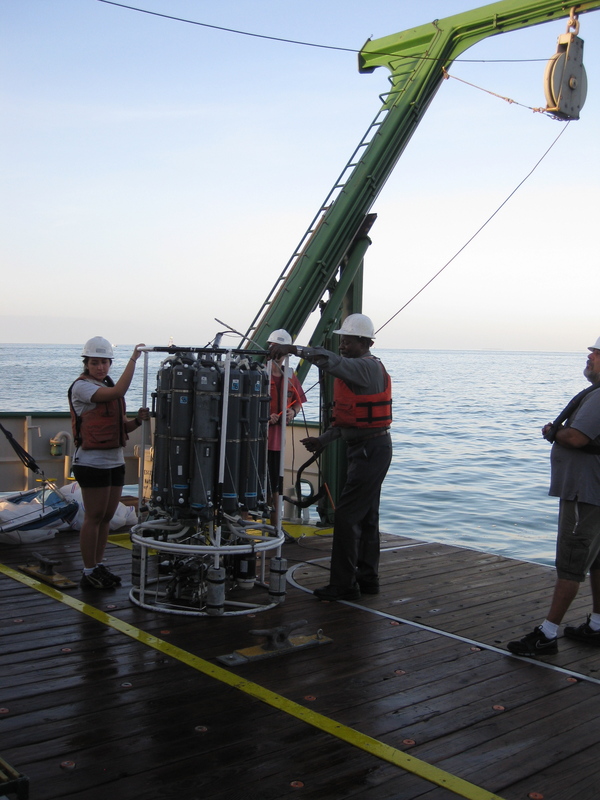 As the CTD lowers, the scientist monitors the CTD instrument real-time readouts. 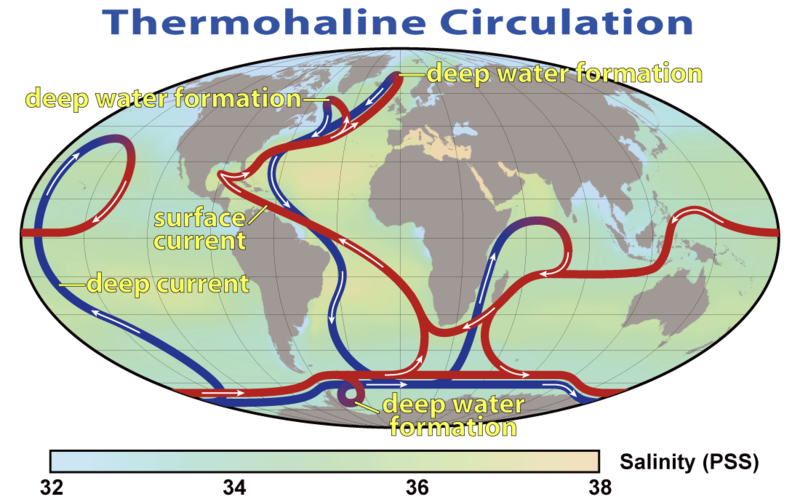 Using a graph of the data, he or she will decide at which locations to close the cylinders on its return trip to the surface. 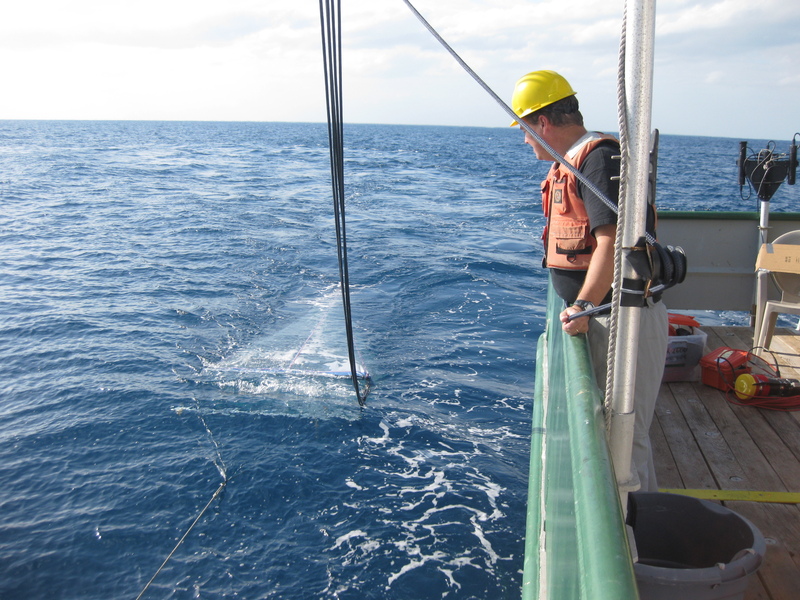 Nelson monitors the CTD data as it is collected. 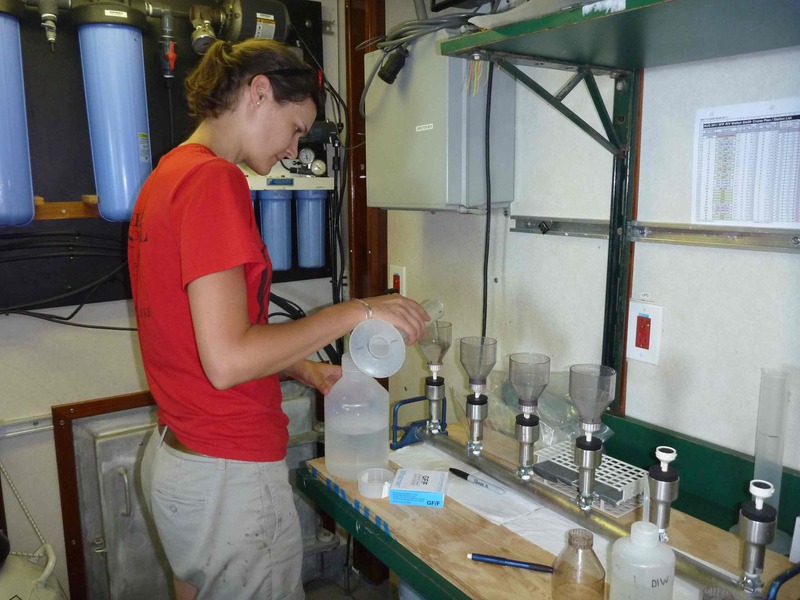 Cheryl is processing water samples from the CTD. Once it surfaces, we’ll assist in placing the CTD back on the deck and securing it. 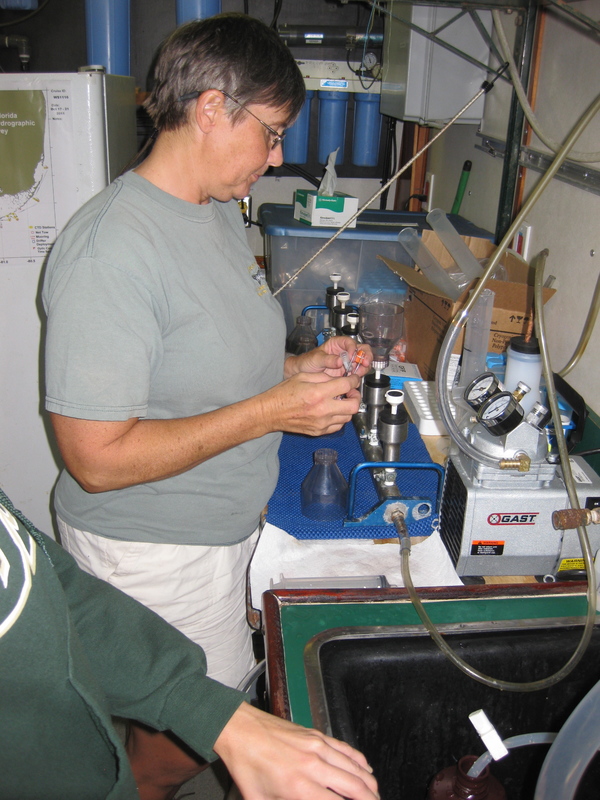 We’ll then take water samples from the grey tubes. 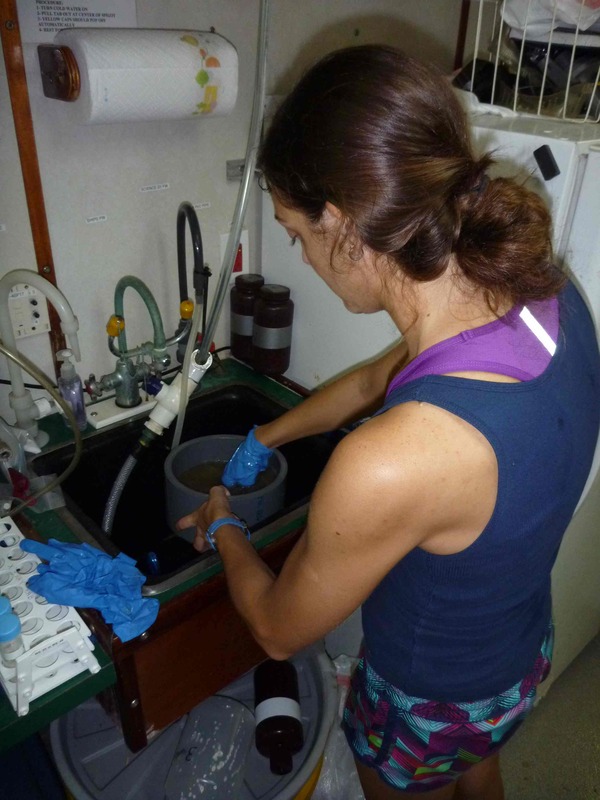 Those water samples will be analyzed in one of the laboratories on the boat. The water samples will show us chemical properties of the water. Teamwork works! It takes a lot of teamwork to make things happen on board. 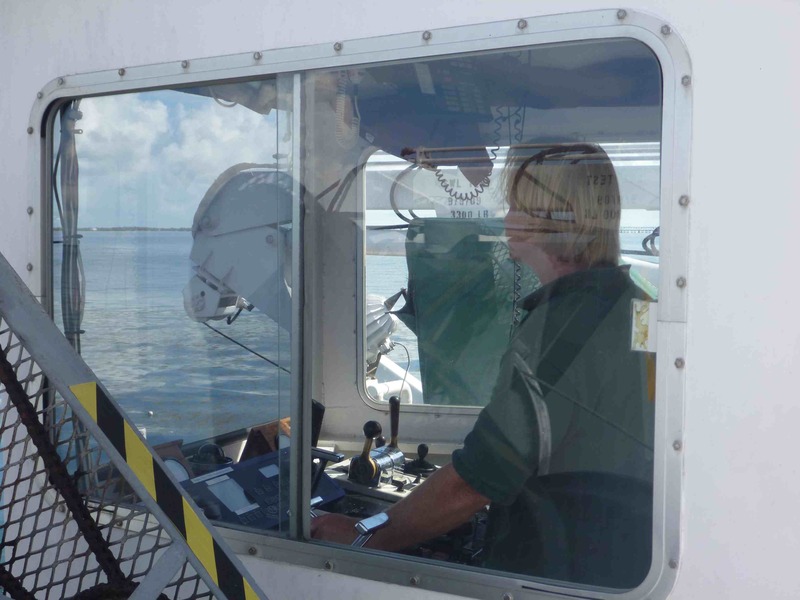 Guiding the boat to the precise locations is the easy part for the crew. They have a GPS to help them do it. After they get there they have to maintain the location. That’s hard when currents, wind and waves, move the boat which is the size of a house. Then they delicately raise and lower the CTD. Crew member Dave preparing to dive in order to remove ropes caught in the ship propeller. If something happens, they also need to fix it. They can’t drive it to a repair shop. They have to fix things on the spot. During the night, some ropes from lobster traps got tangled into one of the propellers. One of the crew put on scuba gear, got in the water, and removed the ropes. 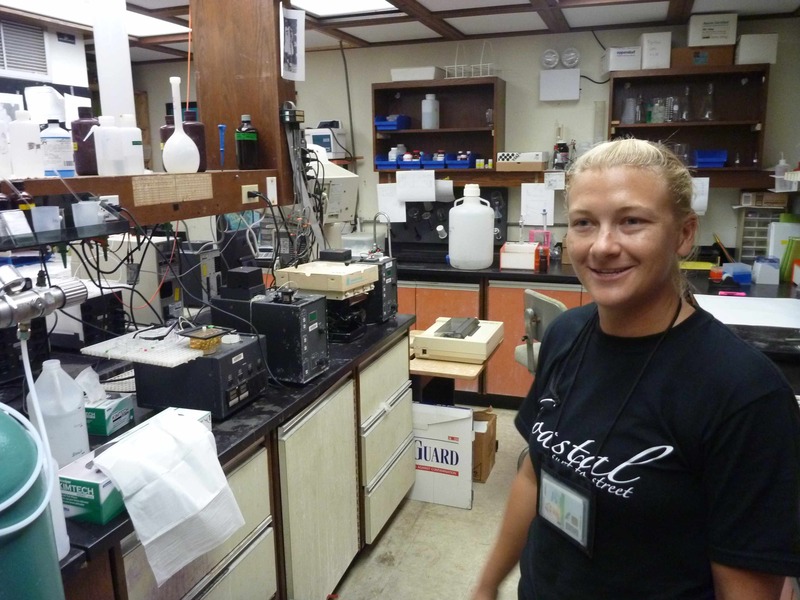 The group of scientists have been organized into a day shift from 7:00 AM to 7:00 PM and the other half is on the night shift for 7:00 PM to 7:00 AM. This can be uncomfortable to have to stay awake all night, but it also means they have to sleep during the day. The day shift will also have a heavier work load because there are additional experiments that have to be done during the sunshine. 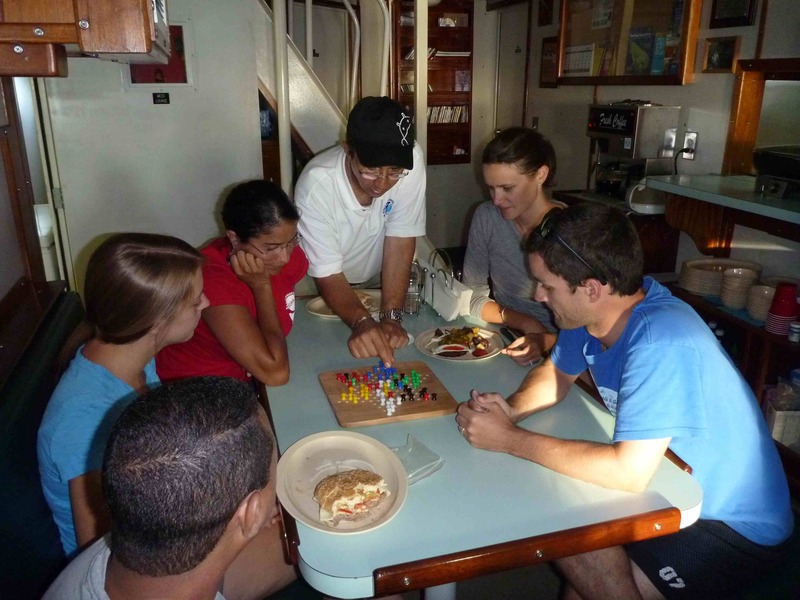 The time is quickly approaching for me to start on my NOAA Teacher at Sea voyage. Before I head off I should tell a little about myself. 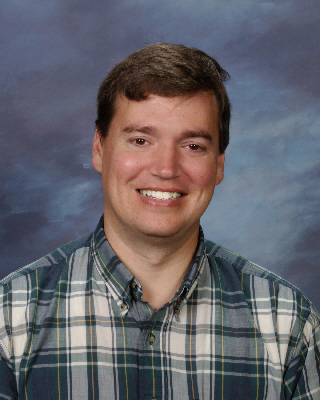 I’m a 3rd grade teacher at Northridge Elementary in Orem, Utah. In my previous 18 years of teaching, I’ve taught students ranging from kindergarten through 6th grade. Of all the subjects I teach, I think science is the most fun. I’ve participated in many professional development opportunities, but I think this will be the most unique. 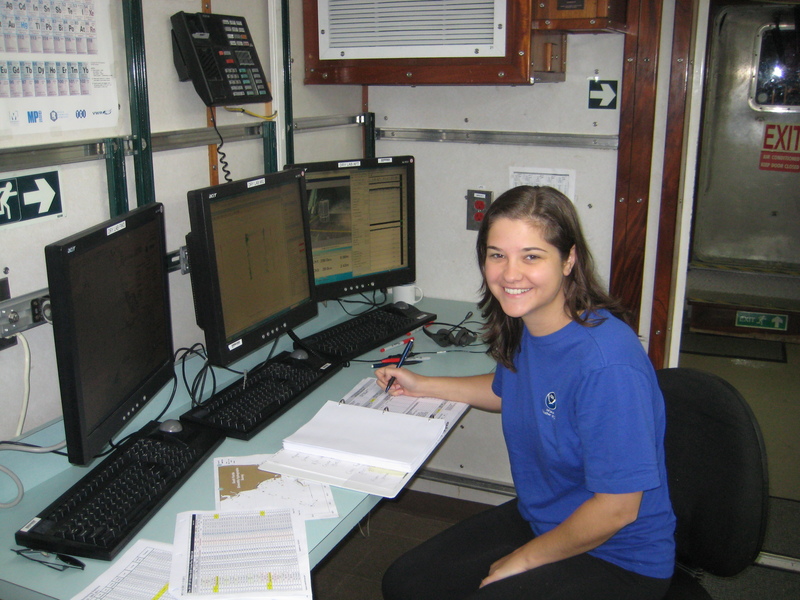 Living at sea on a NOAA ship doing research with scientists and then sharing what I experience and learn with others will be loads of fun. In addition, I’ll be at sea when my students are in school. So, “Hello class!” I’m hoping they follow this blog. If you have a question for me, please post a comment below. I’ll make sure to respond either from ship or when I return. This will be my home for 5 days. I’ll be aboard the R/V Walton Smith for a week. 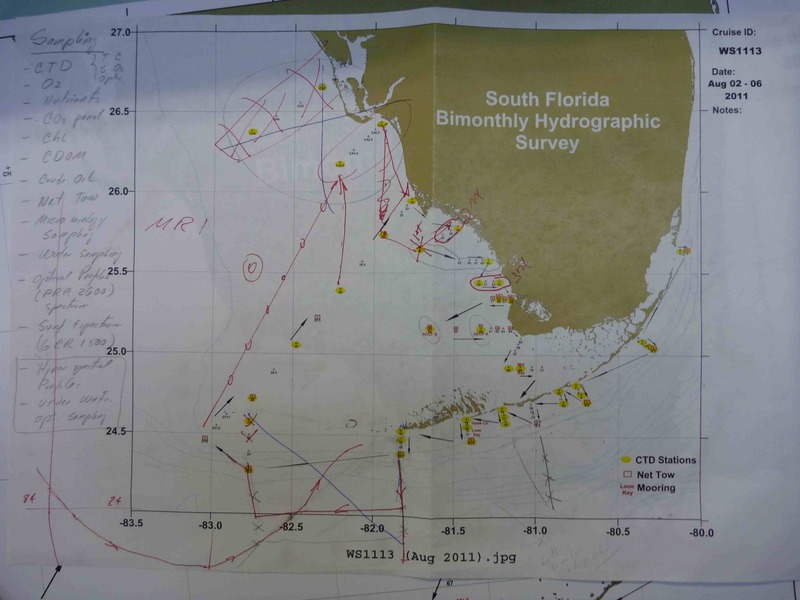 The RV Walton Smith is based in Miami, Florida and we will be doing a Hydrographic Survey. 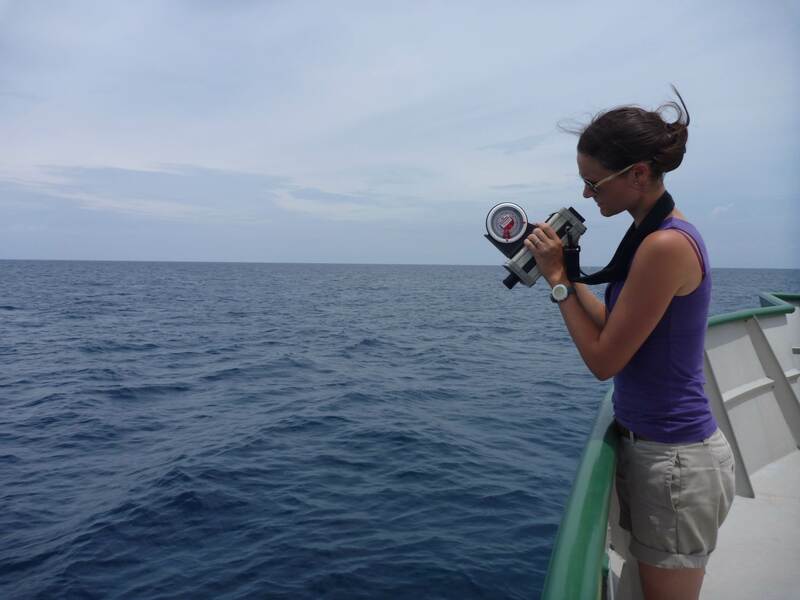 That’s science speak for measuring and collecting data about ocean features such as temperature, water clarity, microscopic plant and animal life and currents and tides. 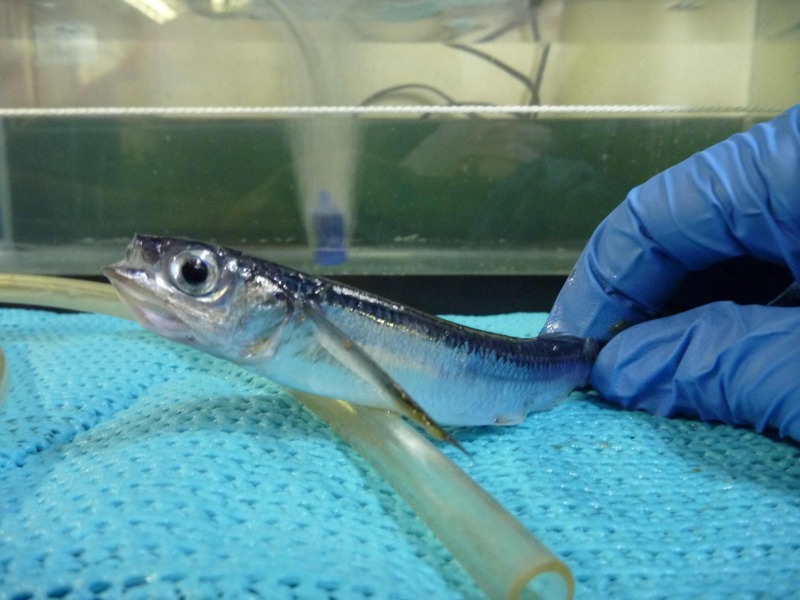 The scientists are interested in learning how the Deepwater Horizon oil platform accident is affecting the plant and animal life in the Florida Keys. It takes a lot of planning to get ready for this type of voyage. Our lead scientist has made a map of the area where we will be. A map showing where we will do our research. Check back, because the next time you’ll hear from me will be from the Florida Keys. Many of you have written comments asking about the marine biology (animals and plants) that I have seen while on this cruise. Thank you for your posts – I love your questions! In today’s log, I will talk about the biology component of the research and about the animals that we have been finding and documenting. 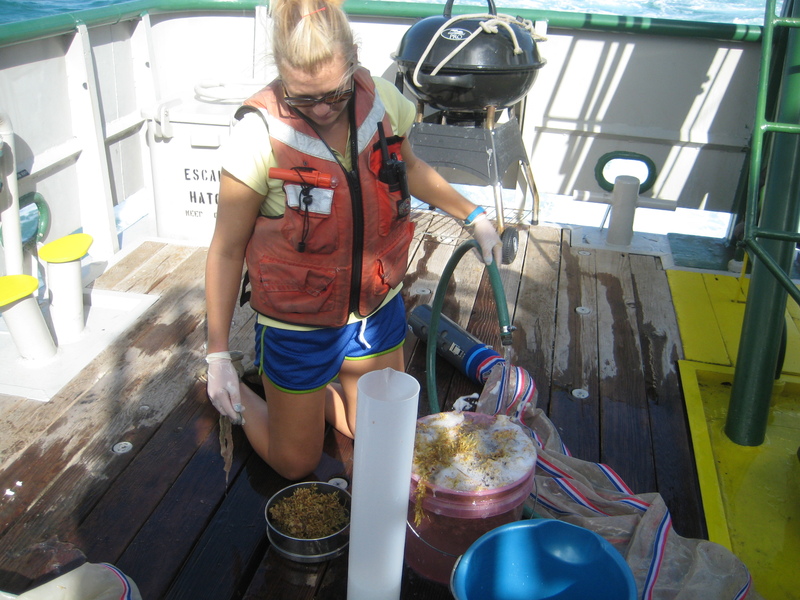 We have another graduate student aboard, Lorin, who is collecting samples of sargassum (a type of seaweed). 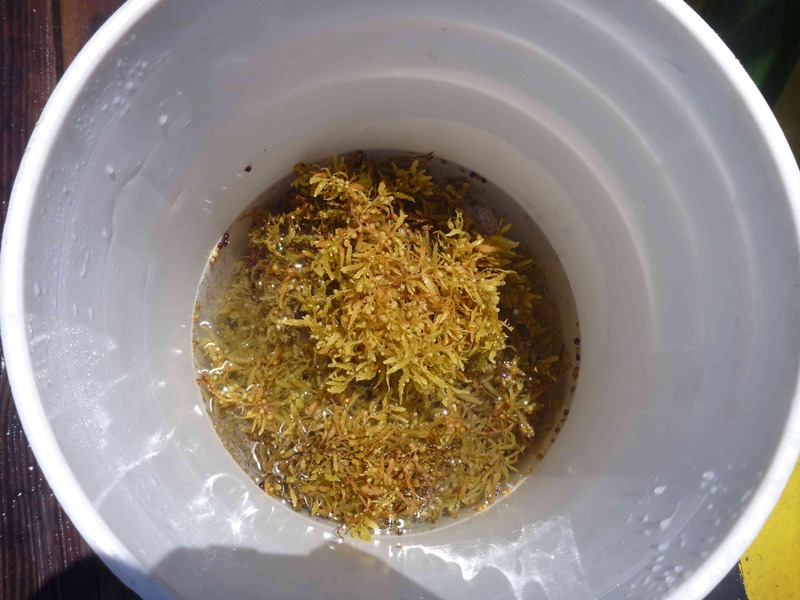 There are two types of sargassum. 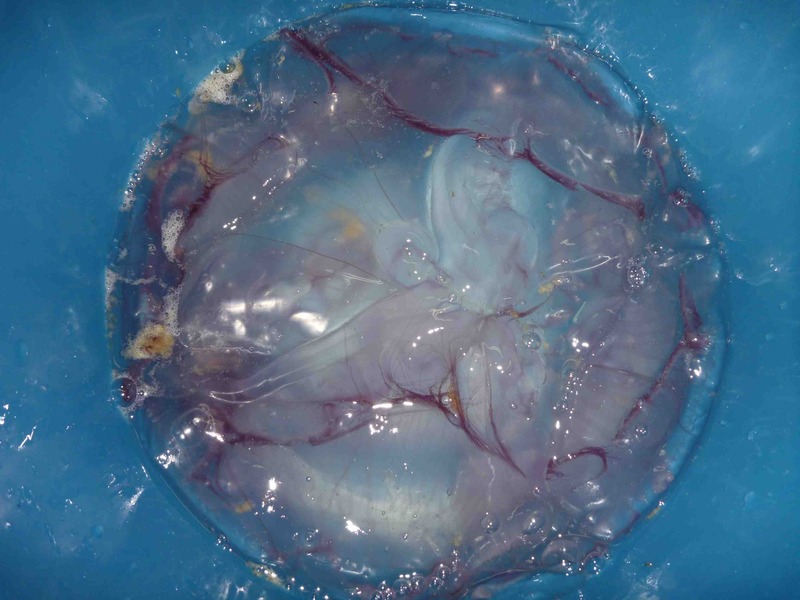 One of those types usually floats at the top of the water and the other has root-like structures that help it attach to the bottom of the ocean. 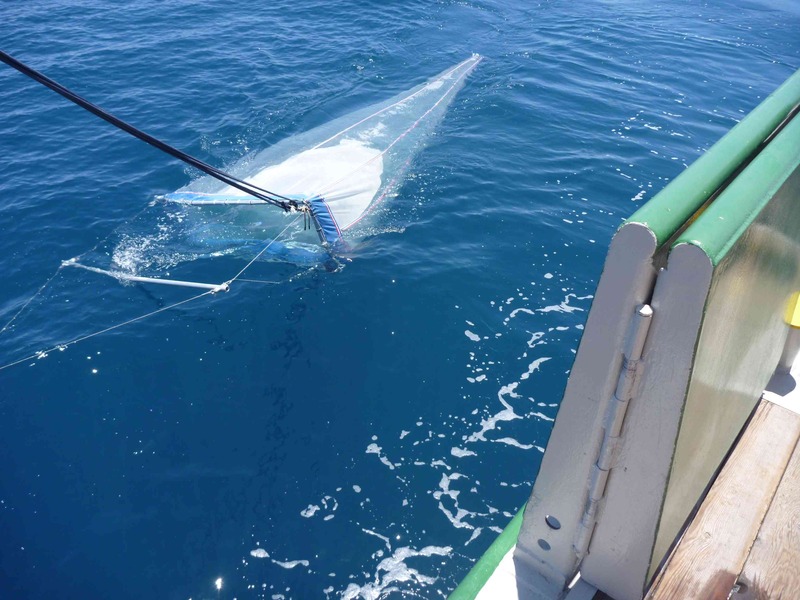 We are using a net, called a Neuston net, to collect samples of sargassum that float. 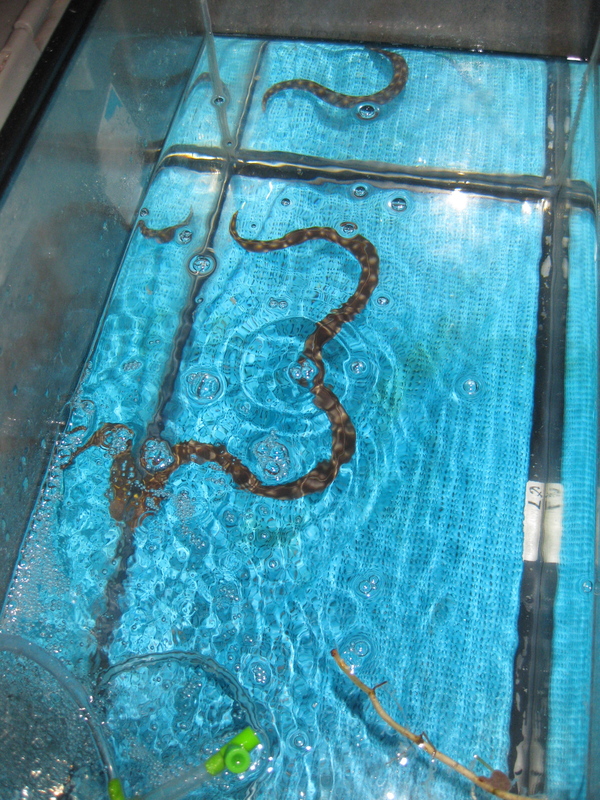 The Neuston net is towed alongside the ship at the surface at specific stations. This means that the ship drives in large circles for 30 minutes which can make for a rocky/dizzy ride – some of the chairs in the dry lab have wheels and they roll around the floor during the tow! 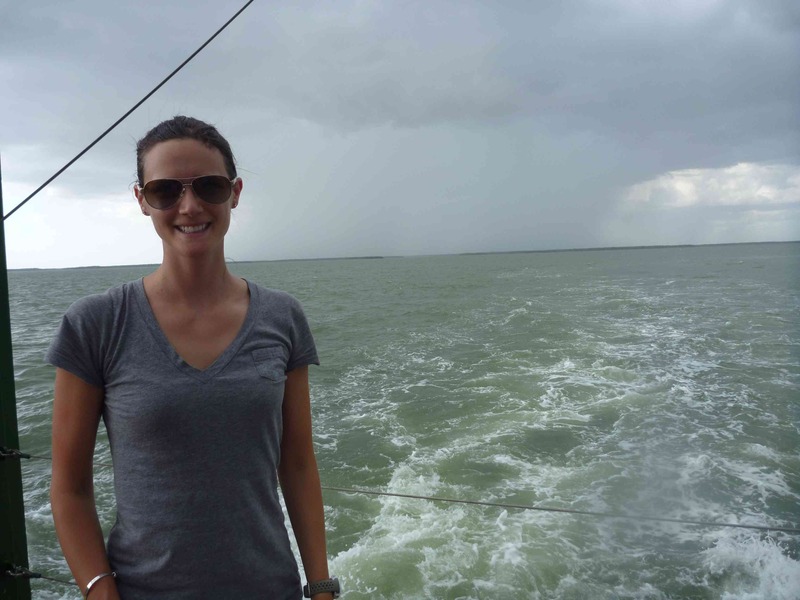 Lorin and other researchers are interested in studying sargassum because it provides a rich habitat for zooplankton, small fish, crabs, worms, baby sea turtles, and marine birds. 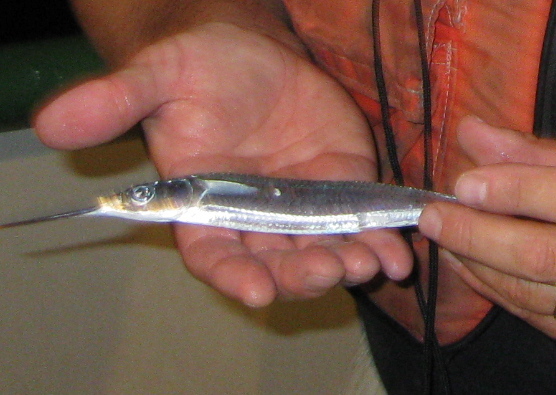 It is also a feeding ground for larger fish that many of you may have eaten, such as billfish, tuna, and mahi mahi. The net not only collects sargassum, but also small fish, small crabs, jellyfish, other types of seaweed, and small plankton. Plankton can be divided into two main categories: zooplankton and phytoplankton. As I said in my last post, phytoplankton are mostly very small plants or single-celled organisms that photosynthesize (they make their own food) and are the base of the food chain. 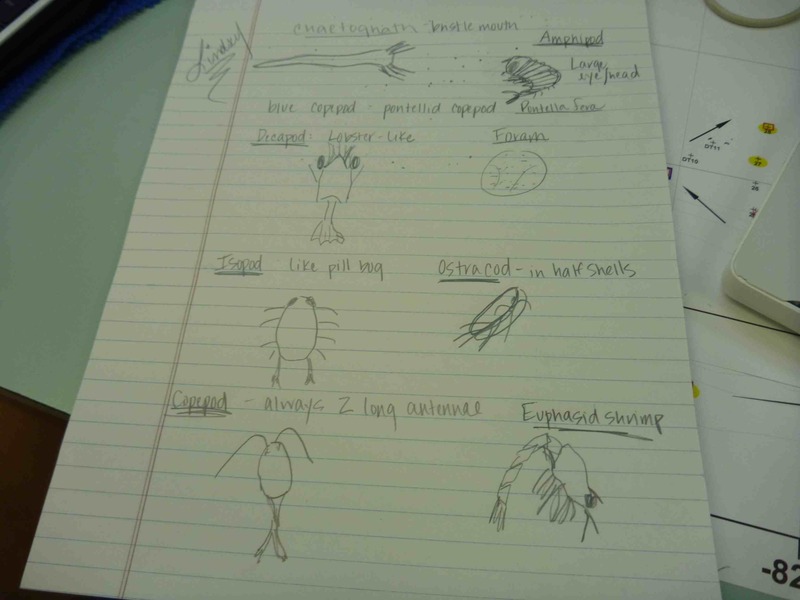 Zooplankton are one level up on the food chain from phytoplankton and most of them eat phytoplankton. 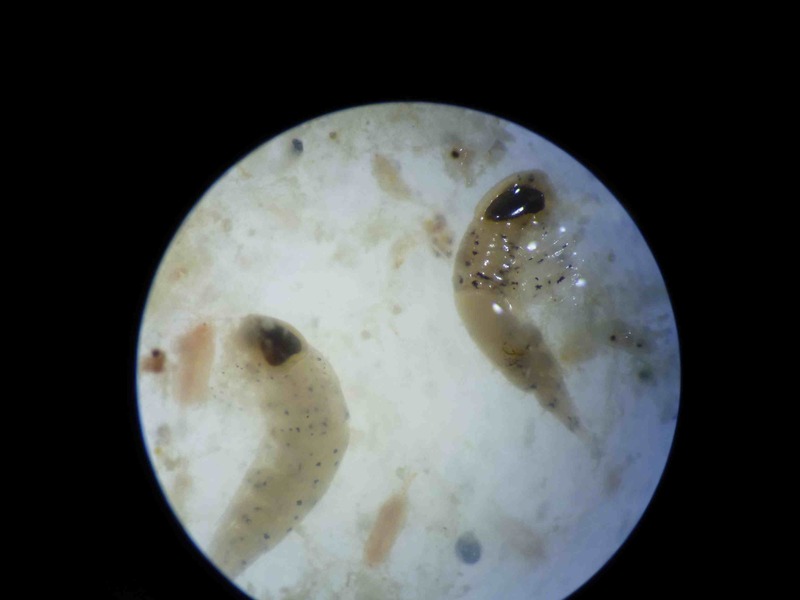 Zooplankton include larva (babies) of starfish, lobster, crabs, and fish. 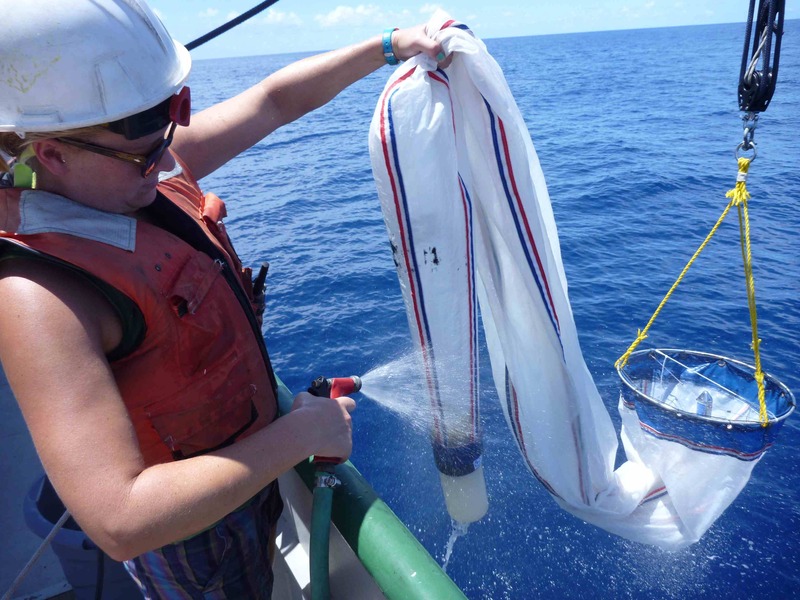 We also use a Plankton net to collect samples of plankton. 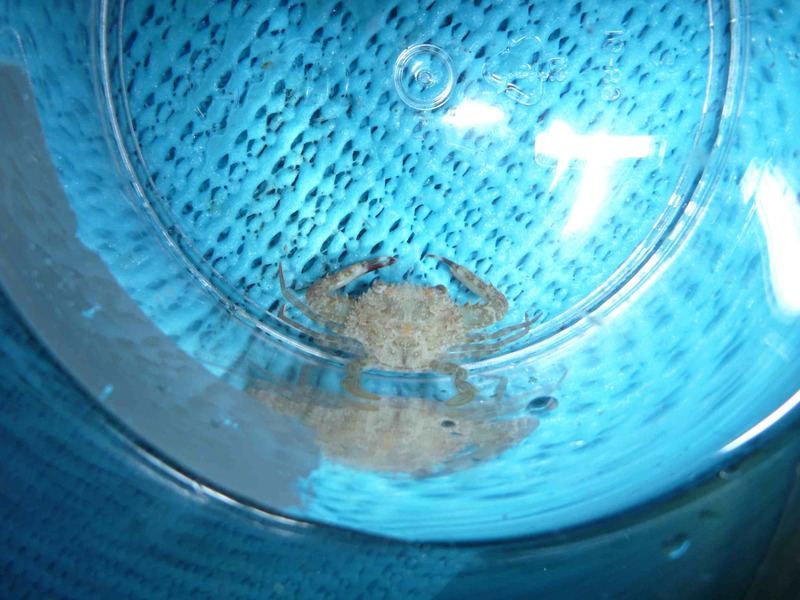 This has a smaller mesh, so it collects organisms that are so small they would fall through the Neuston net. 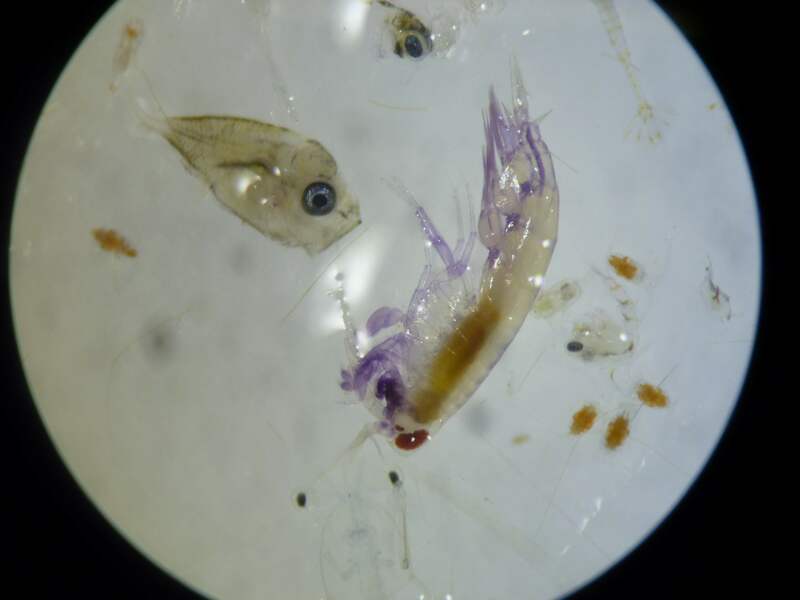 Scientists are interested in studying the zooplankton that we catch in the Plankton net to understand what larger organisms might one day grow-up and live in the habitats we are surveying. 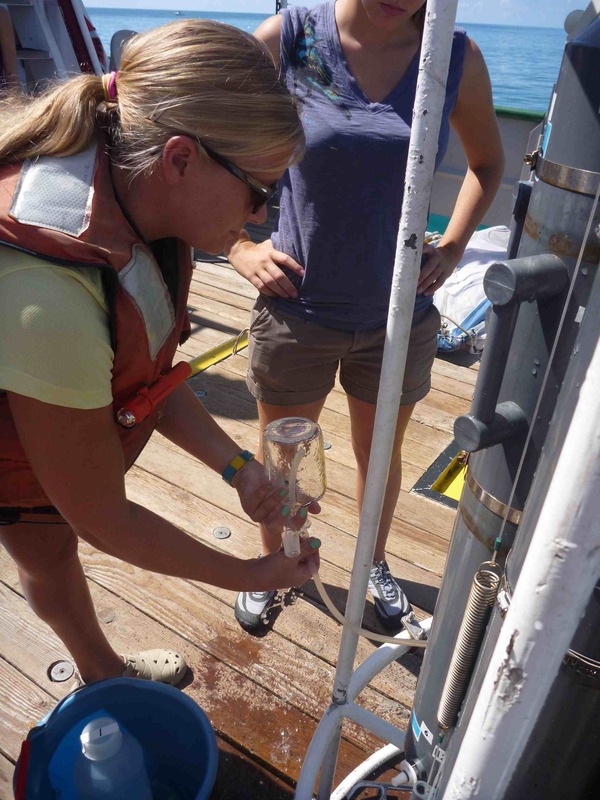 They study the phytoplankton from the Plankton net to see what types of phytoplankton are present in the water and in what quantities. Today we collected so many diatoms (which are a type of phytoplankton) in the Neuston net that we could not lift it out of the water! 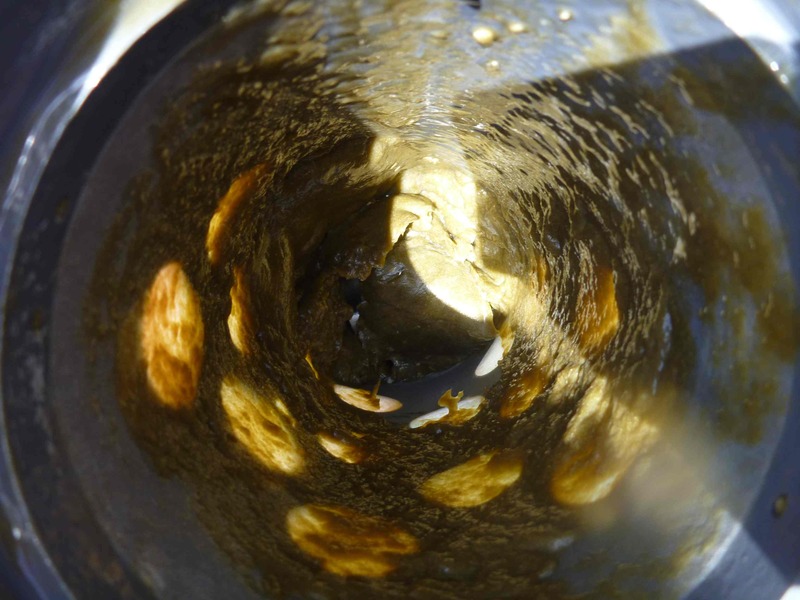 This tells us that there are a lot of nutrients in the water (a diatom bloom) – maybe even harmful levels. I am bringing some samples of the diatoms and zooplankton home with me so we can look at them under the microscopes at school! 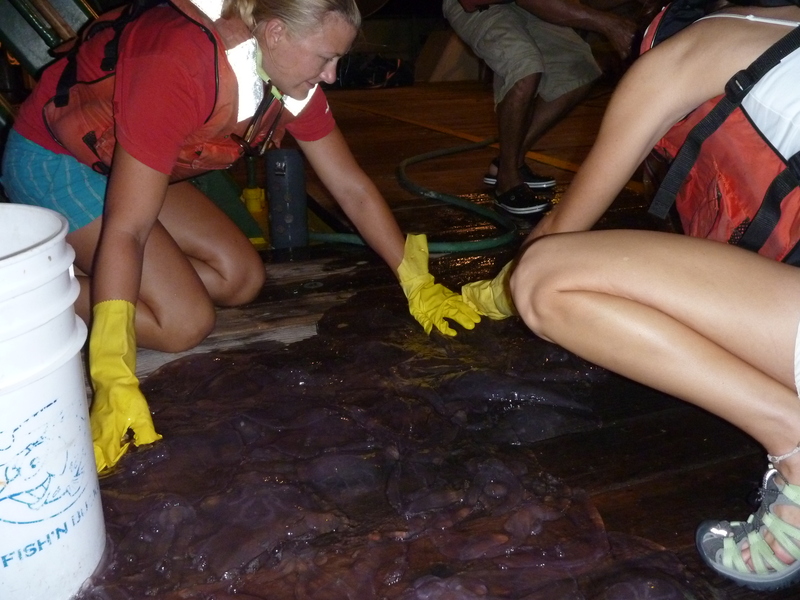 The marine biologists on this cruise are mainly interested in looking at phytoplankton and zooplankton, but we also have seen some larger animals. I have seen many flying fish skim across the surface of the water as the boat moves along. I have also seen seagulls, dolphins, sea turtles, cormorants (skinny black seabirds with long necks), and lots of small fish. 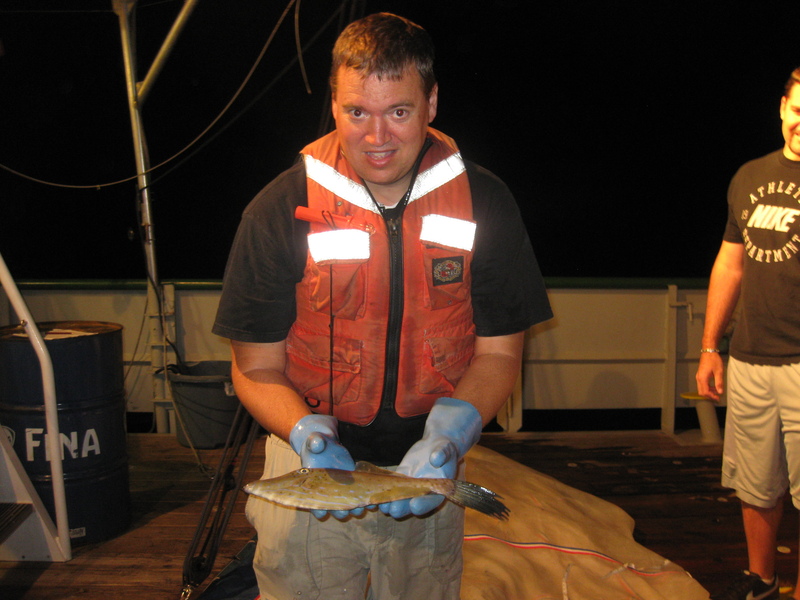 Working as an oceanographer definitely demands flexibility. I have already mentioned that we chased the Mississippi River water during our second day. 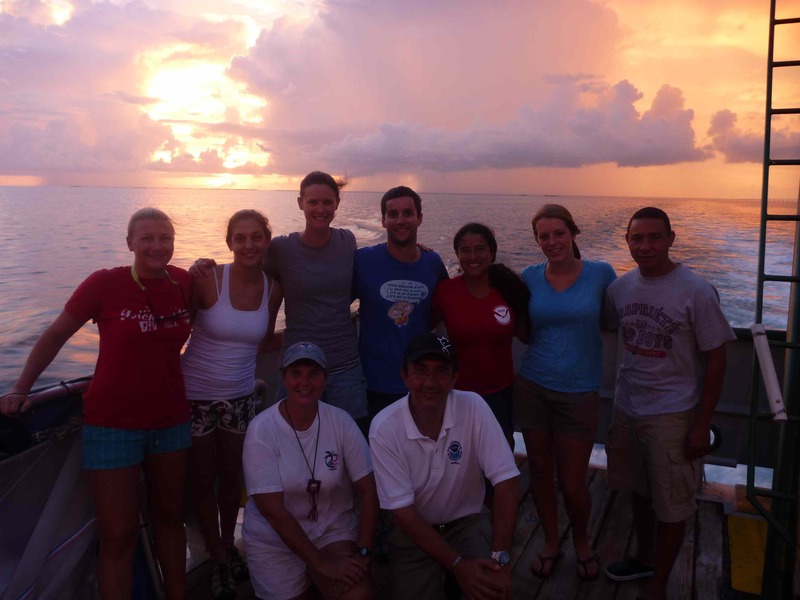 After collecting samples, we had to find blue water (open ocean water) to have a control to compare our samples against. We traveled south through the night until we were about 15 miles away from Cuba before finding blue water. All of this travel was in the opposite direction from our initial cruise plan, so we have had to extend our cruise by one day in order to visit all of the stations that we need to visit inside the Gulf of Mexico. This has meant waking-up the night shift so we can all change their airplane tickets and looking at maps to edit our cruise plan! Many of you are writing comments about sharks – I have not seen any sharks and I will probably not see any. 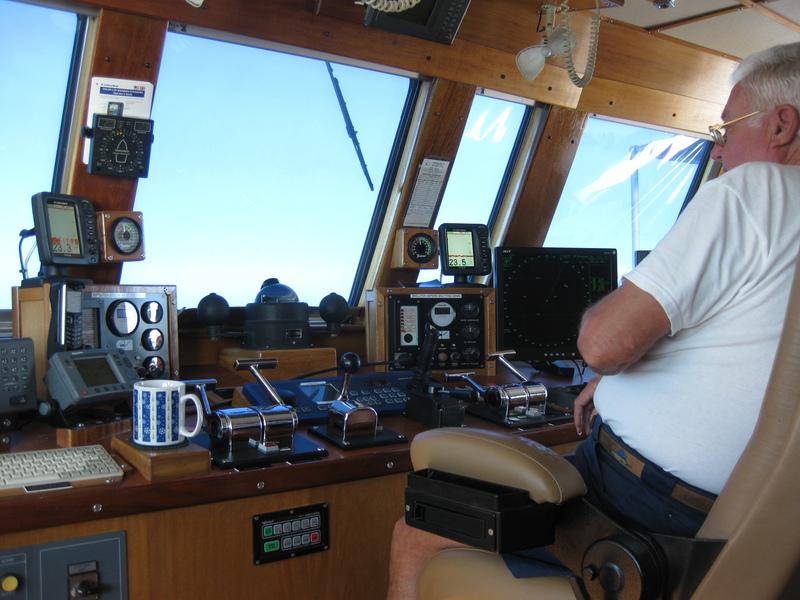 The chief scientist, Nelson, has worked on the ocean for about 33 years and he has sailed for more than 1,500 hours and he has only seen 3 sharks. 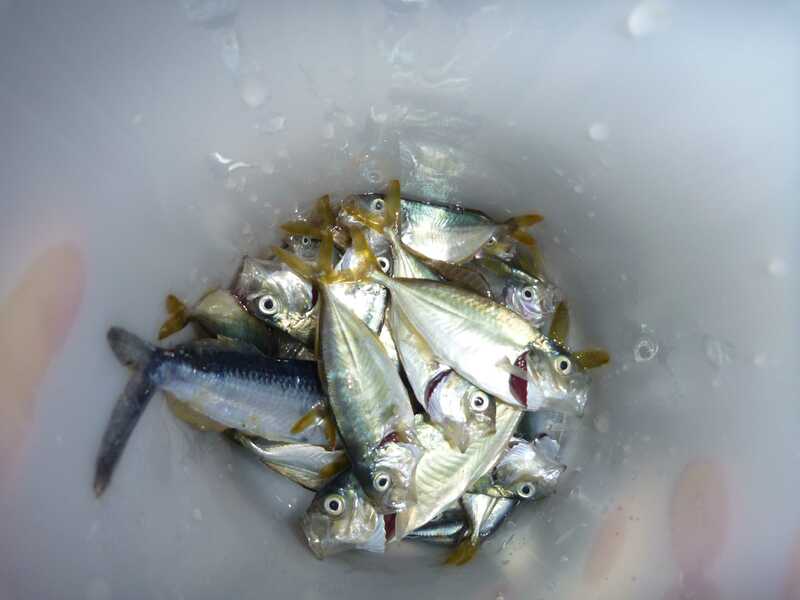 They mostly live in the open ocean, not on the continental shelf where we are doing our survey. If there were a shark nearby, our ship is so big and loud that it would be scared away. Today I saw a group of about 4 dolphins off the side of the ship. They were pretty far away, so I could not take pictures. Their dorsal fins all seemed to exit the water at the same time – it was very beautiful. A member of the crew spotted a sea turtle off the bow (front) of the ship and I saw several different types of sea birds, especially seagulls. The color of the ocean has changed quite a lot during the cruise. The water is clear and light blue near Miami, clear and dark blue farther away from the coast in the Atlantic Ocean, cloudy and yellow-green in coastal Gulf of Mexico, and cloudy and turquoise in the Florida Bay. 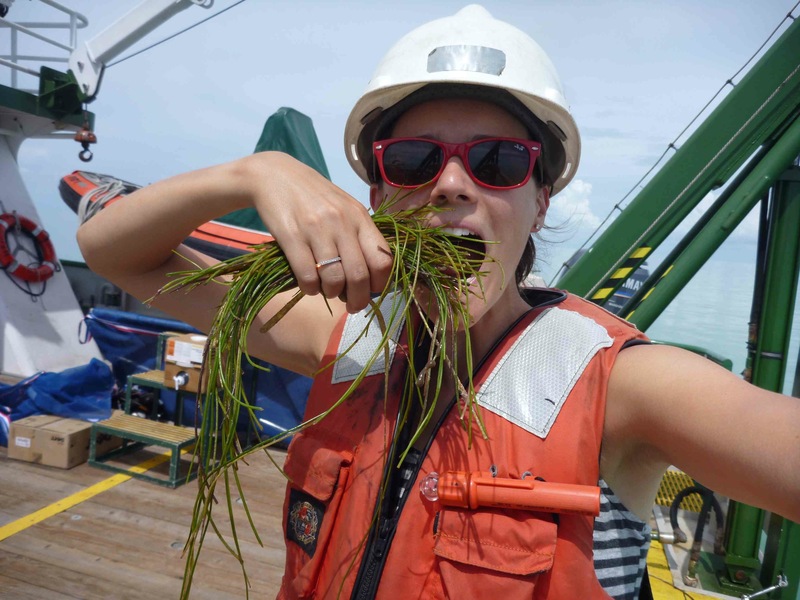 Scientists say that the cloudiness in coastal Gulf of Mexico is caused by chlorophyll and the cloudiness in the Florida Bay is caused by sediment. 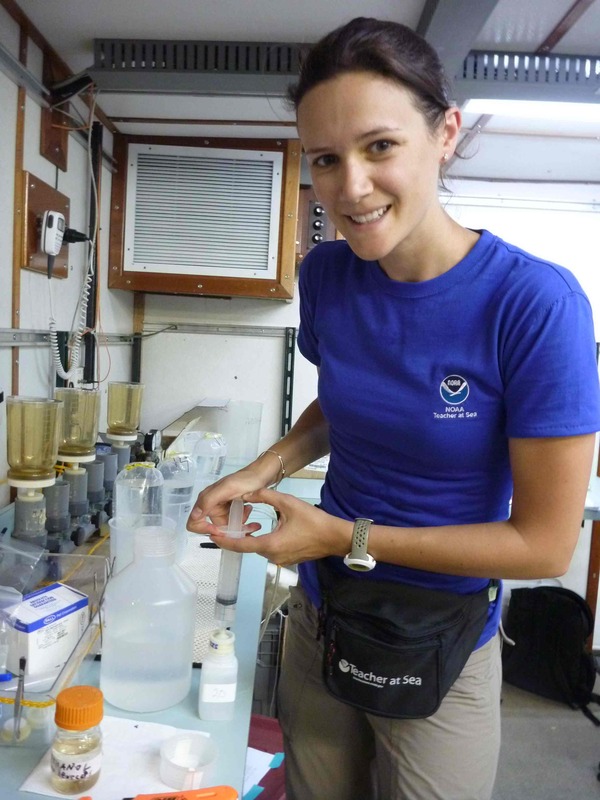 It has been hot and sunny every day, but the wet lab (where we process the water samples and marine samples), the dry lab (where we work on our computers), the galley and the staterooms are nice and cool thanks to air conditioning! 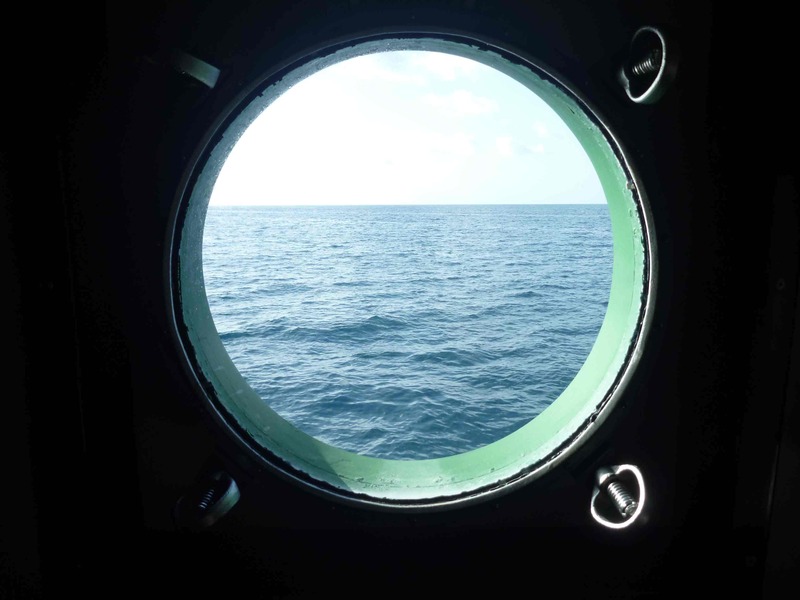 I can tell that I am getting used to being at sea because now when we are moving, I feel as though we are stopped. And when we do stop to take measurements, it feels strange. 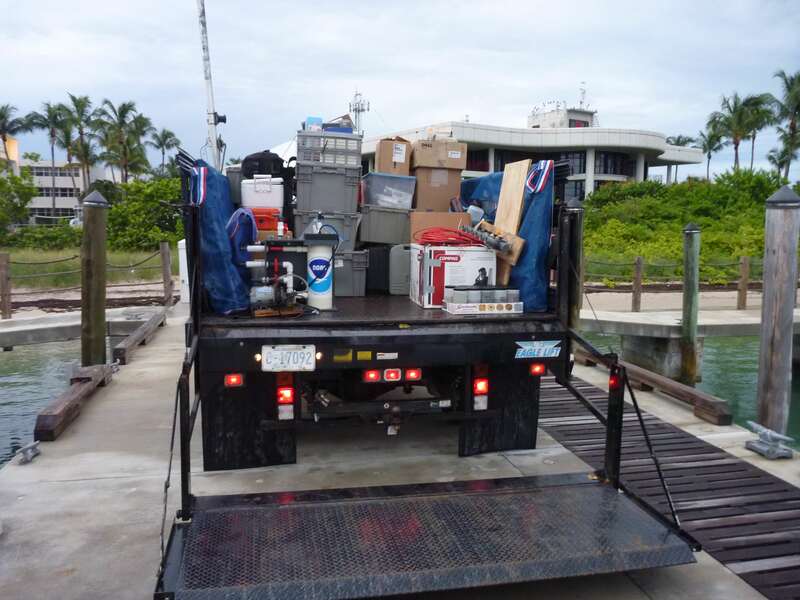 NOAA does not own the R/V Walton Smith. 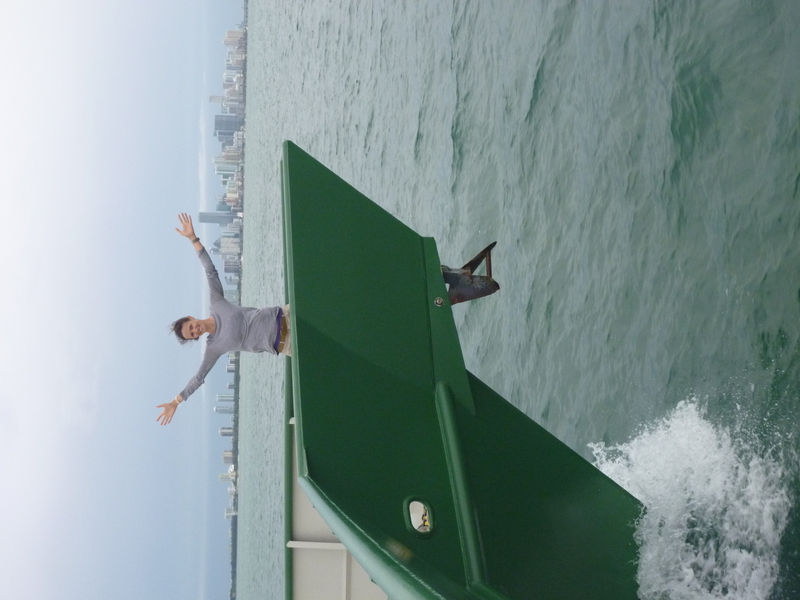 It is University of Miami ship that costs NOAA from $12,000 to $15,000 a day to use!